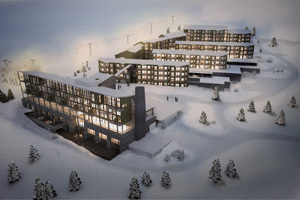 Rezidor Hotel Group will unveil the Park Inn Trysil, in south-eastern Norway, in December. The 369-room property is located in one of Scandinavia’s most popular ski resorts but other activities, including golfing, cycling and hiking are also available. The hotel will have a 425 sqm ballroom, several meeting rooms, an indoor swimming pool, sauna and twelve treatment rooms. "The Park Inn Trysil Mountain Resort will perfectly complement our existing Radisson Blu Resort, Trysil. We are delighted to further strengthen our presence in our key home market Norway and to also further grow our chic and contemporary resort portfolio", said Kurt Ritter, President and chief executive of Rezidor.